The UNSC Resolution 1373 is important for the sole reason that it elevated the ‘war on terror’ to a Global Security Law. It was proactive legislation at international level. To be proactive in action all 192 UN member states need to assist and cooperate with nations incorporating the UNSC Resolution 1373. This then necessitates and binds all UN member states to take action against the 16 organizations declared as LTTE fronts along with those that head these organizations as well as the 424 individuals declared as LTTE supporters. Given that most of the individuals and organizations are operating from overseas and individuals probably hold foreign passports the GOSL must insist that the nations where these individuals and organizations are operating from be immediately investigated jointly with the GOSL law enforcement authorities. EU member nations and other Western nations need to realize that the global war on terror is not restricted to Islamic terrorists on their terror lists alone. LTTE has proven far more dangerous than all terrorist movements put together. The UN Security Council was established under Chapter V Article 24 giving it the responsibility to ensure the ‘maintenance of international peace and security’. Chapter VII gave ‘action with respect to threats to the peace, breaches of the peace and acts of aggression’. Article 41 gave the Security Council the right to authorize non-military action. Article 42 permitted military action should Article 41 response be inadequate. Article 48 the most important makes any decision by the UN Security Council binding upon all UN Member states. 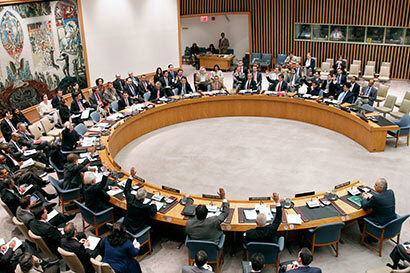 UN Security Council passed Resolution 1373 on 28 September 2001. It was to operate under Chapter VII of the UN Charter. This makes the Resolution binding on all UN member states. Are Sri Lanka’s officials aware that noncompliance is theoretically at least subject to sanctions??? Thus UNSC Resolution 1373 required all UN member states to change their domestic law (criminal and domestic intelligence) parallel to the fight on terrorism. If UN SC Resolution 1373 makes terrorism a serious crime and binds all 192 UN member states to comply, the Sri Lankan Government needs to start making demands on what fellow UN member states need to do to rope in the LTTE fronts and LTTE supporters that Sri Lanka banned in April 2014. Even though there is no international definition on terrorism/terrorist that nations have declared entities as terrorists and banned them using UNSC Resolution 1373 suffices for fellow nations to take action and provide assistance to national governments. The absence of a UN defined Terrorist/Terrorism cannot be held against countries in their fight to end terrorism. If terrorism is regarded as a criminal act, it then necessitates that any country using Resolution 1373 against terrorists operating on their territory and outside requires assistance of fellow governments to arrest and investigate these entities. Therefore, we are curious about the lukewarm reaction to the 16 LTTE fronts, its leaders and the 424 individuals that Sri Lanka declared banned. Member nations must abstain from ‘any form of support, active or passive’ which would benefit a terrorist or affiliated organization including ‘by suppressing recruitment of members of terrorist groups and eliminating the supply of weapons to terrorists’. Member nations required to take ‘necessary steps to prevent the commission of terrorist acts’. Block terrorism financing by freezing assets of individuals and groups on Security Council watch lists (Has Sri Lanka placed the 16 LTTE fronts, its leaders and the 424 in the UNSC watch list, if not it must immediately do so. In response to the UNSC Resolution the EU submitted its report in December 2001 following submissions by its 15 member States (Austria, Belgium, Denmark, Finland, France, Germany, Greece, Ireland, Italy, Luxembourg, Netherlands, Portugal, Spain, United Kingdom and Sweden which covers actions taken within the framework of the Treaty on the European Union and the Treaty establishing the European Community. The report covers actions taken as a Bloc of Nations and not actions taken individually by nations. These GROUP actions are extremely relevant to Sri Lanka’s case given that most of the LTTE fronts are operating from Europe. If those on the list are foreign passport holders they become citizens of EU nations involved and aiding and abetting terrorism which in itself becomes a violation and requires EU member state action or at least investigation. EU nations commit to implementing measures in the Treaty on EU and the Treaty establishing the European Community to deal with the UNSC recommendations on terrorist financing / money laundering. EU Member states to decide on the offences and penalties in respective countries. EU states that the Council Directive (91/308/EEC) adopted in 1991 aims to prevent use of financial system for money laundering. If there is an obligation on financial institutions to maintain appropriate records Sri Lanka must demand EU states to get the banned LTTE fronts to disclose their accounts to show how much they raised and what the raised funds were spent on. If the Directive provides for banks to defy confidential clauses when necessary with an obligation to report suspicious transactions, the Sri Lankan government needs to lobby the EU nations to uphold what they have committed to. The EU 1991 directive was amended on 19 Nov 2001 where in non-financial activities and professions which are vulnerable to misuse of money launderers was included. EU response to how it would prohibit and take measures to prevent recruitment to terrorist groups and supply of weapons to terrorists was also included in the EU Council Directive (91/477/EEC) of 1991 on control and acquisition of weapons which entails all EU member states to ensure that public safety is not in danger and prohibits possessions of certain firearms. The EU Code of Conduct on export of military equipment can be also used to check EU armaments been diverted to terrorists. EU response to denying safe haven to terrorists is Article 23 (1) of the Convention implementing the Schengen Agreement which is part of EC law and become expelled from EU territory. The most relevant and important response by EU to the question on the measures taken by EU to prevent terrorists acting from EU territory against other states or citizens is useful to Sri Lanka. Has Sri Lanka made use of the Early Warning System which was established in May 1999 and available to both EU member states and candidate countries? If there is a uniform format for visas issued by EU states to prevent production and use of counterfeit or false visas how can a large number of LTTE cadres be living in EU nations? What is important for Sri Lanka is that despite the ground force of the LTTE and its leader defeated, there are a large number of LTTE cadres, LTTE supporters and accomplices to LTTE terror around us both in Sri Lanka and abroad. The recent exposure of frauds in immigration and asylum/refugee appeals in the UK should suffice for authorities to realize that terrorism is cohabitating with other international mafia. How far Sri Lanka has pressed and how much foreign nations are committed to take action honouring the UNSC Resolution 1373 is a good question to now probe. What the Sri Lankan state needs to do is to make open its requests to showcase how far it is making diplomatic appeals to generate cooperation from fellow nations to uphold the binding nature of a global international security legislation. This is not any favour Sri Lanka is asking of UN Member nations when Sri Lanka requests nations in the EU, UK, US, Canada, Australia, South Asia, South East Asia, Africa, Middle East, South America, New Zealand and Australia to take action against the 16 LTTE fronts, their leaders and the 424 individuals Sri Lanka has now banned. Liberation Tigers of Tamil Eelam a.k.a LTTE a.k.a Tamil Tigers. Tamil Rehabilitation Organization a.k.a TRO. World Tamil Coordinating Committee a.k.a WTCC. The UN has a Counter Terrorism Committee, its head was recently in Sri Lanka. The Counter Terrorism Committee has been set up to monitor the implementation of the Resolution 1373 and States are given 90 days to respond regarding their progress. This is a perfect opportunity to share the details of the 16 LTTE fronts, their heads and the 424 individuals alongside their passport details, address, employers etc and get the Counter Terrorism Committee to follow up with the nations that these LTTE fronts/individuals are domiciled in. If the Committee functions as a compliance board for the Resolution 1373 Sri Lanka has a friend to go to. Not only must the war on terrorism be on paper and by public announcements, all ‘freedom fighters’ fondled during infancy stages of the insurgency ended up annihilating their masters and out of control or becoming orphans to surrogate nations willing to provide them better deals. Eventually, it is the common masses that end up at the receiving end and dead as victims. If there is sincerity in ridding the world of men, women and children holding arms and indoctrinated the kill there is a requirement for all nations to be open and pledge to eliminate terrorism. The best way the EU and members of Western nations can do to help Sri Lanka is to commence a joint investigation of all the LTTE fronts Sri Lanka has named, the leaders of these 16 LTTE fronts and the 424 individuals Sri Lanka has banned. It may be a long investigation but it is worthwhile starting and the investigators will soon find out how interconnected each are and will be able to also discover what they did with the funds raised.